Who is a Sant (saint)? 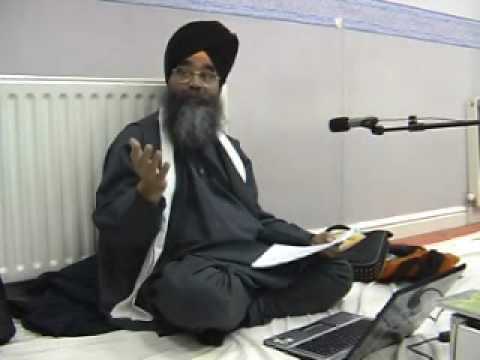 In Sikhi “Saint” or “Sant” (in Panjabi) is not a title or name for a person. Sadly nowadays self-styled God men or the followers of pious Sikhs have ended up using the title of “Sant” (Saint) as part of the name of a leader of holy man. In Gurbani, “Sant” in singular form is either used for Guru Sahib or Waheguru and in plural form it is used for Gursikhs, Sadh Sangat etc. It is not used to praise any single individual as Gurbani only praises Nirgun (Formless) Waheguru. No human is praised in Gurbani. Being Sant is an avastha (spiritual stage), not a title. Every Sikh is Sant and Sipahi so it seems ridiculous to need to have a “Sant” title with your name. A saint need not follow any recognizable form. He will be known by his qualities. A saint unattached to the five deadly sins. He must be pure in thought, word and deed. He is unaffected by the three qualities, of darkness, activity and goodness- Tamas, Rajas and Satav respectively. A saint should regard himself only as an humble servant of God. He voluntarily surrenders himself wholly to His Will. He accepts God as his only prop and support. A saint is not chained by the fetters of rituals, social regulations or public opinion. He is dedicated to the mission of Bhagti, spreading “The Name” among the masses. His only support is ‘The Name’. He finds comfort in melodious kirtan. He regards friends and foes alike. A man of God should follow both personal and social ethics. He is just, tolerant, patient, modest, generous and merciful. He leads an ideal life and is pure and clean. He sets an example for others to follow, not through pride but through humility. He loves to save a lost soul like a shepherd going in search of a strayed lamb. He proceeds slowly and steadily to redeem the wicked ones and bring them to righteous path. « What are the five virtues, according to Sikhi?